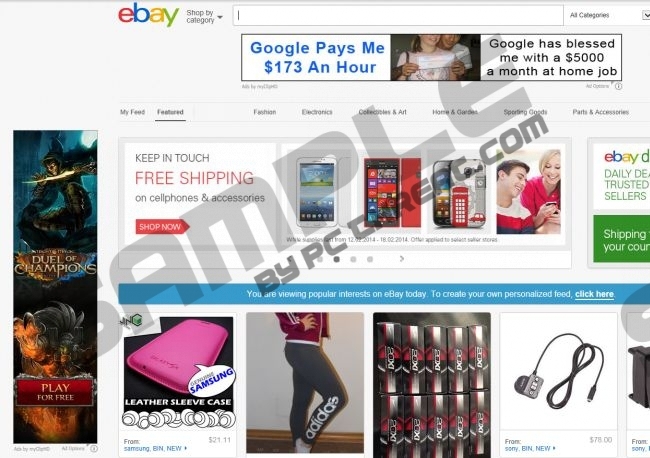 Do you encounter a lot of annoying pop-up ads when you open YouTube, eBay or any other popular website? You should open your Control Panel, go the list of installed programs and check whether you have MyClipHD installed on your computer. At first glance MyClipHD may look like a useful browser extension that should improve the quality of online videos for you, but in reality its main function is to display commercial advertisements. Thus, it is an adware application that needs to be removed from your computer as soon as possible. MyClipHD is created by Bundlelore Ltd. Although these developers have their own official website, there are not applications available for download on it. However, our security research experts claim that MyClipHD is directly related to such applications as OMG Music and Actual Click Shopping. It shows that the program comes from a group of adware applications that have been made to gain financial revenues. There is nothing illegal about it, but whatever MyClipHD displays on its pop-ups, the application does not generate the content itself. If you are wondering how MyClipHD displays pop-ups that more or less are related to your likes and preferences, it happens because the application collects information on your what website you frequent and what keywords you enter into web search engines. It obviously employs cookies to collect this information, and although a lot of web browsers do that to provide with personalized and the most relevant content when you browse the Internet, having MyClipHD collect your information might be slightly risky, especially considering the fact that the application is vulnerable to third party exploitation. To take everything into account, MyClipHD is not a dangerous computer threat, but any security-minded user would want to have it off his/her system. Not to mention, that you should also remove all the other programs which have arrived with it. To make it certain that your computer is protected against any potentially threats, scan it with SpyHunter free scanner and then invest in a licensed antimalware tool if need be. Move mouse cursor to the bottom corner of the screen. Highlight MyClipHD and remove it. Go to Uninstall a program and remove MyClipHD. Select Add or remove programs and uninstall MyClipHD. Should you have any questions about MyClipHD or its removal, please leave us a comment in the box below. Quick & tested solution for MyClipHD removal.